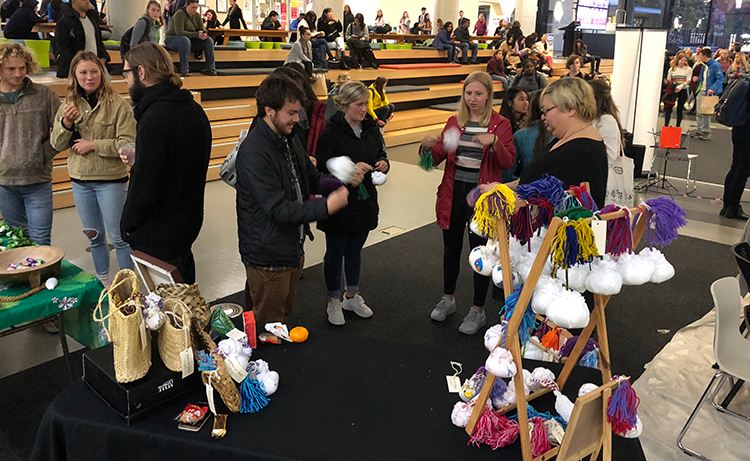 Last week, the Postgraduate Students’ Association (PGSA) hosted its inaugural Cultural Night in The Hub on the Kelburn campus. Students take part in poi demonstrations during PGSA’s inaugural Cultural Night in The Hub. In the depths of the mid-year break, exams were over and The Hub was quiet—few people graced the hallways of the Kelburn campus. It seemed that much of the University community was taking the week at home to recuperate from exams, or to stay out of the cold and prepare for the coming trimester. It was during this week of few other distractions that the PGSA put on the very first Cultural Night. Created to celebrate the cultures of Victoria University, the Cultural Night was held soon after winter solstice and in the midst of the celebration of Matariki. As soon as the event kicked off on Wednesday evening, people were flooding into The Hub to check out what was on offer—kava tasting, poi lessons, Filipino food, Kiwi barbecue, face painting, dance and music! The colours, the crowds, and the costumes were incredible, and the enthusiasm of our community to learn more about their fellow students exceeded our high expectations. The Vanuatu Students’ Association offer kava tasting. 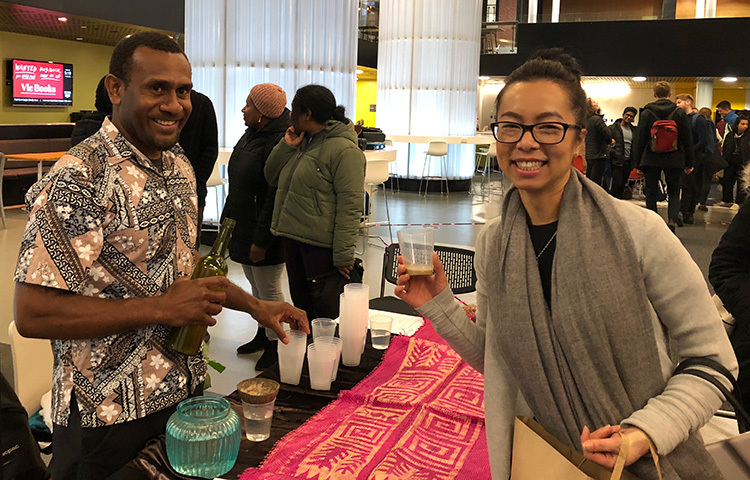 There was excitement and a few pursed lips at the kava tasting stall as students learnt about the ceremonial drink from the Vanuatu Students’ Association. Pākehā and international students stood side by side learning how to swing poi with Nicola from Te Pūtahi Atawhai. Children’s faces transformed as Subject Librarian Maria turned them into lions and superheroes. Alongside the stalls, there was a range of performances of national dances and music. The crowd was mesmerised by the seamless movement of the Samoan student performers, and by the traditional dance of the immaculately costumed Indonesian students. As PhD music student Corrina completed her cello performance, children whispered about becoming as good at their instruments as she is, and the Malaysian dancers brought energy to the room and smiles to the crowd. Audience members enjoy a dance performance by Malaysian students. 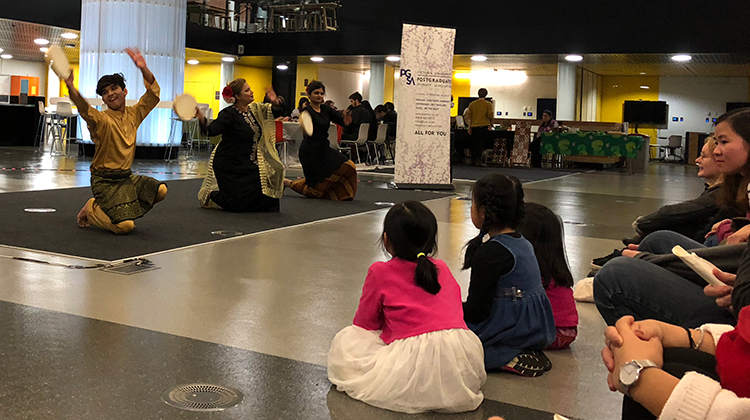 It was amazing to see postgraduate students, new international students, whānau and children of students, staff, and the wider Victoria University community taking the opportunity to gather together to learn, understand and celebrate different cultures. Equally, the generosity of our clubs, associations, staff members, and wider Wellington cultural groups in coming along to this event to teach and demonstrate their culture for our community was inspiring.